Sculptor, painter, and architect Tony Smith made scores of small- and large-scale sculptures before his death in 1980 at age 68. Currently, there is no complete and easily accessible digital inventory of Smith's outdoor works and their locations. As I first mentioned in a September 21, 2012, post, the International Network for the Conservation of Contemporary Art - North America and the Tony Smith Estate, represented by Matthew Marks Gallery, want your help in documenting, via Wikipedia and Flickr, every outdoor sculpture Smith created. To date, a list of some 100 outdoor sculptures has been created online but it is not considered definitive. Consequently, additional calls to enlist the public's help have gone out to try to ensure the success of the Tony Smith Wiki Project. In addition to documentation about the location of any of Smith's outdoor artworks, the project is seeking images, researched and first-hand histories and assessments of the sculptures (here's an example), and bibliographic articles. The necessary details for participating in the crowd-sourced project, as well as resources (for example, Tony Smith Outdoor Sculptures on Flickr) to facilitate the public's efforts, are found here on Wikipedia. As an incentive to promote participation, a commemorative t-shirt, featuring an image of Smith's black-finished Marriage on the front and the INCCA-NA logo in black-and-white, has been designed (see image) as a give-away. Because the project is part of an ongoing centennial celebration (Smith would have been 100 on September 23, 2012), the edition is limited to 100 and will be distributed on a first-come first-served basis to project participants who create an article about a Smith artwork and leave a note about it on the Wikipedia Talk Page for Richard McCoy, who helped create the Wiki project. and the socioeconomic realities in which such violence flourishes. The cemetery of El Velador — "The Night Watchman" — in Culiacan, capital of Mexico's northern state of Sinaloa, is the final resting place of some of the country's most notorious drug lords. The graves of the dead, many opulent beyond belief, their number increasing with the still-climbing number of deaths from the ongoing drug war in the country, are the subject of director Natalia Almada's extraordinary and important documentary El Velador (Altamura Films, 2011), the trailer for which is embedded below. In the approximately 60-minute film, Alamada, whose own family is from Sinaloa, accompanies a guard named Martin on his nightly rounds to watch over the grandiose mausoleums, documents construction and care of elaborate tombs, and shows us how "ordinary existence persists [amid violence]. . . and quietly defies the dead." It is estimated that more than 60,000 lives have been lost since 2006, when Mexico's former president Felipe Calderon declared war on the drug cartels. (Search Google using the simple phrase "Mexico drug war" and more than 39 million hits will be returned, a telling statistic on this entrenched armed conflict between rival cartels killing each other and the Mexican government forces tasked to eliminate them.) The violence has continued since the 2012 election of Enrique Pena Nieto. Crushing the illegal drug trade has profound implications for the United States to which most of the drugs flow. 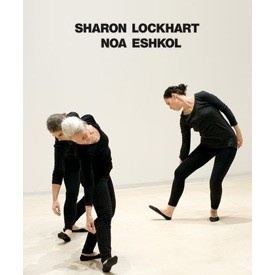 The documentary, which had its premiere in June 2012 at the Museum of Modern Art in New York City, was broadcast nationally for the first time in September and has been screened widely, is available through Icarus Films. Almada is a 2012 MacArthur Fellow, a MacDowell Colony Fellow, a 2010 USA Artist, a 2011 Alpert Award recipient, and a 2008 Guggenheim Fellow. In 2009 she was awarded the Jacqueline Donnet Emerging Documentary Filmmaker Award. Her other films include The Other Side, El General, and All Water Has Perfect Memory. * Read Almada's enlightening 2011 interview with BOMB Magazine here. Noteworthy is her statement, "The imagination can sometimes be more powerful than a photograph. To suggest and to evoke rather than to illustrate is a way to engage and commit the viewer." Her film does not depict violence, a decision she explains beautifully: "If we reduce the idea of violence to the horrific acts that we see in the press, then we fail to understand the deeper systematic violence. All we see is the atrocity. We no longer see the humanity of the victim or the perpetrator, nor the violence that is inflicted on the community that lives within this context. . . ."
of the clock at midnight. going to be sweet or sour. baked, and smoked. End sweet. success don't wait to find you. I've read many collections of poetry in the last six months, a number of which I'm re-reading or keeping close to hand instead of moving to my over-burdened shelves. Below are eight titles that have given and continue to give me particular pleasure and that I recommend if you're in search of words that matter, take you deep, or just make you wonder at how much can be said in so few words. ✭ Amanda Auchter, The Wishing Tomb (Perugia Press, 2012) — See my review here. 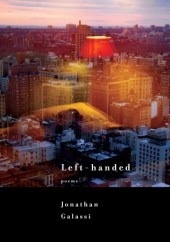 ✭ Jonathan Galassi, Left-Handed (Knopf, 2012) — Some of Galassi's honest and refined poems can rend the heart; "Ours" in this collection is one of the best examples of the power of a single word. ✭ Matthea Harvey, Of Lamb (McSweeney's Books, 2011) — Poet Rae Armantrout described Harvey's poems, which are accompanied by images of marvelous paintings by Amy Jean Porter, as "like a Valentine's Day chocolate with one drop of arsenic." The collection makes for a wonderfully charming tale that I've read, delightedly, several times. ✭ Rebecca Lindenberg, Love, An Index (McSweeney's Books, 2012) — To read this elegiac collection with the knowledge that the poems are dedicated to another poet, Craig Arnold, who vanished while traveling in Japan in 2009, is to understand Lindenberg's fierce sense of loss and also the depth of her love. Through her words she reclaims the meaning of her relationship with Arnold and ultimately, I think, celebrates hope. Her "Aubade", appearing toward the close of the collection, is especially lovely. 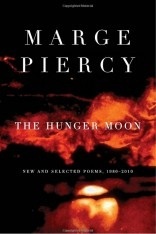 ✭ Marge Piercy, The Hunger Moon: New and Selected Poems, 1980-2010 (Knopf, 2012) — This collection offers a wonderful way to get reacquainted with Marge Piercy, a poet I first read in the early 1970s and have continued to read over many years. Piercy's voice remains for me one of the finest among contemporary poets. ✭ Adrienne Rich, Later Poems: Selected and New, 1971-2012 (W.W. Norton, 2013) — Rich herself made the selections for this volume before her death. While I'm most drawn to her earlier work in this collection, I find in her more recent poems plenty of evidence of that passionate voice that for many of us in the 1970s and 1980s could and did stand in for our own. ✭ Kevin Young and Michael S. Glaser, Eds., The Collected Poems of Lucille Clifton 1965-2010 (BOA Editions, 2012) — This is, for me, an indispensable compilation of Clifton's work. in the morgue in '91. Serge in love never made. This poem is my response to today's photo prompt at Magpie Tales. Go here to see the image, drop a link to your own ekphrastic poem or piece of flash fiction, or to read other writers' inspired contributions. Serge Gainsbourg's house in Paris remains as it was the day he died, everything but the pianos in place. and often, our last . . . .
Piercy is one of my favorite poets. Her poem from which the two lines above are taken is included in the wonderful compilation The Hunger Moon: New and Selected Poems, 1980 -2010 (Knopf, 2012). Many poems by Piercy have appeared at The Writer's Almanac and Monthly Review, among other online periodicals and journals. ✦ You'll want to visit illustrator Wendy MacNaughton's Website more than once. Her portfolio is full of wonderful visuals. Recently, MacNaughton collaborated with Maria Popova of the marvelous Brainpickings to spotlight Susan Sontag's reflections on art. ✦ Hope, desire, and yearning for freedom are expressed in Iranian artist Hojat Amani's series of angels (inkjet prints on canvas). Read an interview with the artist here. Saro-Wiwa is the founder of multimedia company AfricaLab. Also see her documentary Transition. ✦ Ai Weiwei's Circle of Animals | Zodiac Heads is on view at Hirshhorn Museum, Washington, D.C., through February 24. Ai talks about his work in the video below. Also on view is "Ai Weiwei: According to What? ", also running through February 24. ✭ "Collected Stories: Books by Laurie Anderson" continues through February 3 at the University of Washington's Henry Art Gallery's Test Site. The exhibition includes some 40 years of early to recent work, some rare, highlighting performance artist and musician Anderson's interests in storytelling, drawing, and technology. Anderson worked with the curators in making the selections, which range in format from handmade and traditionally bound works on paper to audio and electronic. See images at the link. ✭ Running through March 3 at Museum of Contemporary Art, North Miami, is "Bill Viola: Liber Insularum", primarily comprising works since Viola's 1997 retrospective at Whitney Museum. Among the works on view are Reflecting Pool, Surrender, The Quintet of the Astonished, Unspoken, Observance, Catherine's Room, Four Hands, Three Women, Ancestors, The Raft, and Ascension. If you're in the city during the exhibition, make time to visit. I've seen a number of exhibitions of Viola's work; he is not to be missed. See my post "Video Artist Bill Viola at SLAM". ✭ Art restorer Mark Leonard, currently chief conservator at Dallas Museum of Art, has produced 11 paintings that respond to John Constable's cloud studies. Installed at the Yale Center for British Art, New Haven, Connecticut, "Reflections on Constable's Cloud Studies" continues through March 10. ✭ In West Palm Beach, Florida, Norton Museum of Art is showing "Sylvia Plimack Mangold: Landscape and Trees" as part of its program RAW - Recognition of Art by Women. The exhibition, continuing through March 3, includes paintings, drawings, and prints. 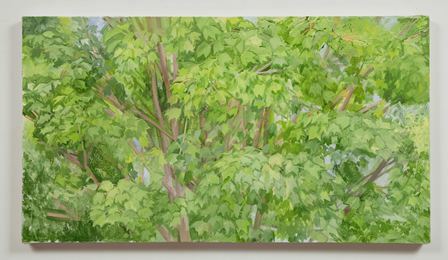 Oil on Linen, 20" x 36"
Oil on Canvas, 110" x 90"
I first wrote about Theo Jansen in June 2011 and then followed up in 2012 with a post about an animation inspired by Jansen's invented life forms, called "Strandbeests". Since then, a Canadian collective, Salazar, has produced and directed for Red Bull Media House the short documentary that follows. If this is your first introduction to the fascinating Dutch artist and engineer, be prepared to be awed by his kinetic sculptures. Theo Jansen from Salazar on Vimeo. I like to be aware of everything. Renowned glass artist Ginny Ruffner of Seattle, Washington, is a model both of reinvention and inspiration. More than two decades ago, Ruffner was in a three-car accident that left her in a coma for five weeks. Even after she rallied, she was not expected to walk or talk again. Though she was hospitalized five months and had to use a wheelchair for five years, Ruffner beat the odds against her — she says the "bull-headed part" of her was "not damaged" — and returned to her artmaking (she paints, draws, and sculpts also) with the help of an artistic team. Ruffner, born in 1952 in Atlanta, Georgia, is the subject of the full-length documentary A Not So Still Life from director Karen Stanton and producer Tom Gorai. The film traces Ruffner's life beginning with her childhood in South Carolina and concluding with her reclamation of her highly creative artistic career. you believe. If you believe it's real, it is real. . . .
"a not so still life" teaser from ShadowCatcher on Vimeo. In a video interview here, Rufffner speaks about her accident and remarkable life and artistry. Work by Ruffner is in many public collections worldwide, including those of Cooper-Hewitt National Design Museum (New York), Corning Museum of Glass (New York), Hokkaido Museum of Modern Art (Japan), Kunstmuseum (Germany), Metropolitan Museum of Art (New York), Seattle Art Museum (Washington), and Smithsonian American Art Museum (Washington, D.C.). she said, is more terrifying than arithmetic. in the places she filled. and never try to be whole again. and costume jewelry is so not your thing. what you alone can keep in the light. This poem was inspired by a quote in a late 2012 Guernica magazine interview with writer Sandra Cisneros, who said, "I think one of the great primordial fears we have once we become conscious of our aloneness as children is the fear of losing our mother. We have that from the moment we realize we can lose her just in the supermarket. As a child, it was more terrifying than arithmetic. When I lost my father, I though I learned about grief and transition. However, nobody tells you what's it's like to lose your mother. They don't tell you that you're going to feel like an orphan at whatever age you are as an adult. . . ."
to be left to experts. Max Garland has succeeded Bruce Dethlefsen as Wisconsin's 2013-2014 Poet Laureate. He was selected by the Wisconsin Poet Laureate Commission, now overseen by the Wisconsin Academy of Sciences, Arts & Letters. (See note below at Wisconsin Academy link.) As did Dethlefsen, Garland will serve a two-year term (January 1, 2013 - December 31, 2014). My post on Dethlefsen and my post on Marilyn L. Taylor, who preceded Dethlefsen in the job, include information about the unpaid position while it was a state position, as well as additional resources to complement those below. Max Garland, who spent a decade as a mail carrier in western Kentucky and currently is an English professor at University of Wisconsin-Eau Claire, has published two collections of poetry: The Postal Confessions (University of Massachusettts Press, 1994), awarded a Juniper Prize for Poetry and an Outstanding Achievement Award from Wisconsin Library Association, and Hunger Wide as Heaven*** (Cleveland State University Poetry Center, 2006), which won the Cleveland State Poetry Center Open Competition. Garland's chapbook Apparition (Parallel Press) was published in 1999. In addition to teaching and writing, Garland plays in the band Eggplant Heroes, based in Eau Claire. Garland's poetry ranges over such subjects as religious faith (he cites the King James version of the Bible as an early and sustained literary influence), memory and redemption, time's passage, mortality and loss, childhood and family life, the world and Cold War politics, romantic love, loss of innocence, and connection to place (Garland grew up in Paducah, Kentucky). Work, too, figures among influences on his poems (see, for example, "Early Work" in Hunger Wide as Heaven or "The Postal Confessions" in The Postal Confessions); according to a biographical statement in an anthology of Kentucky poets (see link in Resources), Garland not only has been a mail carrier; he also has worked as a grocery store clerk, janitor, termite inspector, paper deliverer, and pizza cook, among other jobs. and possibly yet to be born. And a good poem is never obsolete. The days break their backs on the wide brown water. between the girders of the Brookport Bridge. and the scare of its shadow on the current. . . .
slinking like an eel. . . .
of Adam, his first mistake,. . .
lured from the dreaming Adam, . . . .
~ from "Revisiting the Sistine Chapel"
was the best time a tail-fin ever had. . . .
~ from "Requiem for a Boom Town"
Sometimes I wake up with my hillbilly voice. I don't know why. Maybe a dream took me back. The catalpas wilting in the heat. The dust-devils walking the dry field. through the silt and accumulated years. like stubble in a milo field. . . . 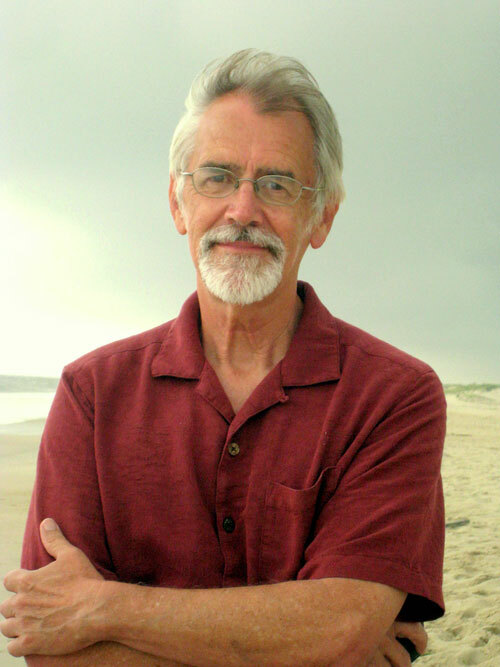 Poems, as well as stories and essays, by Garland have been published in numerous literary periodicals, including Chicago Review, Crazy Horse, Dogwood: A Journal of Poetry and Prose, Georgia Review, Gettysburg Review, Ploughshares, Poetry, and Prairie Schooner, and have been featured at A Writer's Almanac (National Public Radio). His work has been anthologized in I Know Some Things (Faber and Faber), The Most Wonderful Books (Milkweed Editions), Best American Short Stories 1995 (Houghton Mifflin Co.), and Billy Collins's anthology Poetry 180: A Poem a Day for American High Schools, among others. Garland's honors include a National Endowment for the Arts Fellowship in poetry, a James Michener/Copernicus Society of America Fiction Fellowship, a Bush Artist Fellowship (the Artist Fellows program no longer exists; see Bush Foundation's Bush Fellowship Program), and two literary fellowships, one in poetry and one in fiction, from Wisconsin Arts Board. Other awards include a poetry fellowship from the Wisconsin Institute for Creative Writing, a poetry fellowship from Dane County Cultural Affairs Commission, a Tara Award for Short Fiction, and a 2004 Arts and Letters Poetry Prize. * * * Also available at Amazon. Encore: More of Parallel Press Poets, Chapbook (Parallel Press, 2006 ) on GoogleBooks includes Garland's poem "Homer". free — to press or not. make a sure but natural motion to oppose. just one tiny pulse on its own. This poem responds to today's photo prompt of a hand in a hand at Tess Kincaid's Magpie Tales. Go here to read others' responses to the prompt or to leave a link to your own contribution of poetry or flash fiction. Anne-Marie O'Connor, "Her Magical World", LA Times, June 19, 2003 (To describe Caland's life as "interesting" — she is the only daughter of the first president of Lebanon — would be a great understatement.) Also see Joanne Warfield's article "Byzantium in Venice: A Visit with Hugette Caland". ✦ The Historical Publications section of Cooper-Hewitt, National Design Museum (part of the Smithsonian Institutions), features more than 25 titles about the museum's collections. Published between 1978 and 1987, the documents are free online. Also available are more than 50 titles dating from 1896 to 1968, including past museum exhibitions. A sampling of titles indicates a wide range of subjects, from embroidered samplers and buttons in the collections to theatre designs, architectural drawings, and rare books. ✦ Abstract photography of UK-based Mitch Payne is a highlight of Visual Exploration of the Periodic Table Families. ✦ There's much to praise in the work of award-winning freelance illustrator and graphic designer Allegra Lockstadt. I especially like Lockstadt's Hand Gestures, part of her wonderful Posture Perfect series of drawings whose source is women in the fashion industry. 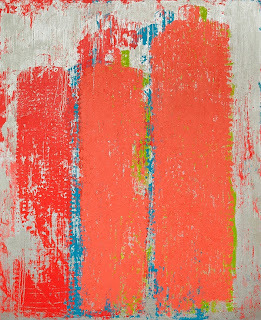 See more of Lockstadt's work in the Featured Artist section of Paper Darts (November 2012). ✦ Fans of Alberto Giacometti: Take note of the recently launched Giacometti Foundation Website. ✭ The 15th Annual Postcards From the Edge, hosted by Sikkema Jenkins & Co., New York City, takes place January 25-27 (the preview party is January 25). Celebrating and benefiting Visual AIDS's 25th Anniversary, the event offers for $85 each, first-come first-served, any of more than 1,500 postcard-size artworks, all displayed anonymously. Each 4"x6" painting, drawing, photo, print, or mixed media work is original; each participating artist has been allowed to submit just one entry. On February 28 at 6:30 p.m., at The Jewish Museum, Lockhart will discuss the exhibition with Hunter College art history professor and Hunter College Galleries curator Katy Siegel. Tickets are required. The exhibition was organized by the Los Angeles County Museum of Art and The Israel Museum, Jerusalem. ✭ In Washington, D.C., the National Gallery of Art is presenting on the Upper Level of the East Building through February 17 "Modern Lab: The Box as Form, Structure, and Container". The exhibition examines the box as material object and in relationship to optical devices, architecture, and death. ✭ Opening January 28 at Albin O. Kuhn Library and Gallery, University of Maryland/Baltimore, is "Persian Visions: Contemporary Photography from Iran". Showcasing 20 of Iran's most accomplished and well-known photographers, the exhibition, which runs through March 24, includes 58 images and two video works on the subject of family, history, place, mortality, language, and memory. A checklist of artists and their work is here; see a selection of images here. Press about the show, which has been touring since 2009 and will continue on to the University of Southern Maine Art Galleries (September 26 - December 8, 2013), Schingoethe Museum at Aurora University in Illinois (January 8, 2014), and Richard E. Peeler Art Center at DePauw University (March 20, 2014), is here. The terrific artist Terry Dixon, whom I interviewed last year (Parts 1, 2, 3), is among artists and filmmakers exhibiting in "Convergence: Jazz, Films, and the Visual Arts", opening February 14 at The David C. Driskell Center, University of Maryland, and running through May 31. The exhibition features 65 works that depict or are influenced by jazz culture and music. Approximately 60 of the artworks come from the center's own collections; five films are from the American Jazz Museum's John Baker Film Collection. A two-day conference, February 14 and 15, "Jazz: A Dialogue in the Performance and Visual Arts" will be presented in conjunction with the show. when words fail to get through. that keep you still, not noticed. in the streets of our own downtowns. when you tip the glass to toast. Stand and be moved from silence. Name the unnamed your self. to leave us children unsilenced. but never let them cover your mouth. This poem is inspired by my recent re-reading of Audre Lorde's "The Transformation of Silence Into Language and Action", a speech presented December 28, 1977, to the Modern Language Association's Lesbian and Literature Panel, Chicago, Illinois. (See Lesbian Herstory Archives Digital Collection for a sound recording.) The speech was first published in Sinister Wisdom 6 (1978) and The Cancer Journals (© 1980, 1997 by Audre Lorde and Aunt Lute Books). "The Transformation of Silence into Language and Action" also is available in Sister Outsider: Essays and Speeches by Audre Lorde (Crossing Press, 1984, 2007) on GoogleBooks. Berlin-based artist Uli Westphal is fascinated by our perceptions of what is natural and unnatural, and conceived of The Mutato Project as a way to "document, preserve, and promote the last remainders of agricultural plasticity", that is, "the way fruits, roots, and vegetables can actually look (and taste)". His Mutato-Archive is a collection of "non-standard" fruits, roots, and vegetables that we don't see in our grocery stores, where supposedly "natural" produce has been reduced, Westphal explains, to "a highly designed, monotonous product." In the video below, Westphal talks about his project, begun in 2006, and shows examples from his Mutato-Archive. To date, Westphal has documented more than 150 mutatoes. To support his work, he sells offset prints of his finds. His presentations are photographed beautifully. He's also pulled together a collection of links to articles, books, documentaries, and Websites that are concerned with agriculture and food production. See more of Westphal's projects here. My thanks to Alimentum Journal, where I first saw Westphal's thoughtfully conceived and articulated work. to put a finger on. The TweetSpeakPoetry blog launched a series in October called "Poetry at Work". I decided to have some fun with the theme and to try to write about a job I'd never had, using, if possible, the occupation's lingo. "Beat Cop" was my first effort, and today, which is the first Poetry At Work Day, I dedicate the poem to police officers everywhere. There are plenty of online dictionaries you can use to find terms peculiar to certain kinds of occupations or work but any creativity in using it is up to you. What job will you choose to celebrate today? Share a link to your own post the Comments section below. my workday and work on it. Information about the honorary state position and related resources are found in my post about Sue Brannan Walker, whom Glaze succeeds. I tend to write what to me is in the ear. surprising ways of putting things together. Andrew Glaze, now in his '90s, has published eight volumes of poetry and two collections of selected works. His first book Damned Ugly Children: Poems (Trident Press) was published in 1966, when he was in his mid-40s; widely lauded, the collection was nominated for a Pulitzer Prize and also was included on the American Library Association's Notable Books List. His Remembering Thunder (NewSouth) was issued in 2002. Some other collections, most available through resellers, are Greatest Hits: 1964-2004 (Pudding House Press, 2005); Someone Will Go on Owing: Selected Poems 1966-1992 (Black Belt Press, 1998), winner of the 1998 SEBA Book of the Year Award for poetry; and I Am the Jefferson County Courthouse and Other Poems (Thunder City Press, 1981), a Best Small Press Title. Glaze, in addition, has published translations, including Masque of Surgery: Poems and Translations from the Spanish (Menard Press, 1974). Called a "sort of everyman poet" with "unusual talent", the Harvard-educated Glaze also has written plays and is at work on a novel Moody's Trip (an excerpt from which appeared in Birmingham Arts Journal). Glaze worked for a number of years in the South as a court reporter, witnessing the hatred and violence of the Ku Klux Klan toward African Americans and civil rights demonstrators, activities that became subjects of some of his exceptional poetry. Glaze's highly accessible, lyrical poems, typically written in free verse, are marked by a deep intuition about and understanding of the human condition, especially in the context of his life in the South and, later, in New York City and Miami, Florida. His themes range over love, family, marriage, death, politics, city life, and artistic life. Just a few quotations from his poems are needed to give a sense of the often surprising, frequently stunning use to which he puts language: "Hope is a catch in the trap of feathers. . . // . . . Soon enough we're trapped in our running, / By what we call happiness, / The girdling hedge of desperation. . . ." ("Trap of Feathers"); "Someone has built at dirigible in my parlor. / What on earth has happened to the boarders?. . . . ("Zeppelin"); ". . . A tunic of dark wood crawls on the island breast / Up where a lowering purple mountain rides, / God of desire; . . ." ("Antigua"); "To a generation raised on Bonaparte / Beethoven's actual appearance / Raised doubts. . . ." ("Ludwig Rellstab's Visit to Beethoven"). Glaze has published poems in numerous literary journals and periodicals, including, most recently, Birmingham Arts Journal, Florida Journal for Literary and Fine Arts, New River, New York Quarterly, and Trails & Timberline Quarterly. His work also appears in many anthologies, including Working the Dirt (NewSouth Books, 2003), The New Yorker Book of Poems; Selected by the Editors of the New Yorker (William Morrow & Co., 1994), Alabama Poets: A Contemporary Anthology (Livingston University Press, 1990), and Best Loved Poems (Merit Publishers, 1980). An essay by Glaze about life in Alabama appears in The Remembered Gate: Memoirs by Alabama Writers (Deep South Books, 2003). Over his long career, Glaze has received a number of awards, including a Bruce Rossley Literary Award (2000), a Hackney Literary Award in Poetry from Birmingham-Southern College, and an ABA Online Award (1998). Poetry magazine presented Glaze with its Eunice Tietjens Award in 1951. In this video, Glaze reads his epic poem "I Am the Jefferson County Courthouse". Also see Andrew Glaze reading "Earl", "Generations", "A Journey", and "Book Burial". Note: My post on new Wisconsin Poet Laureate Max Garland will appear on January 21. Monday Muse Asks Did You Know?